The Medical Sciences Club (MSC) at Charlottesville High School is sponsored by the University of Virginia School of Medicine’s chapter of the Student National Medical Association and by Charlottesville High School, the UVA Office for Diversity and the Daniel Hale Williams Pre-Health Society at the University of Virginia. The CHS MSC program is modeled after the Student National Medical Association’s Pipeline Mentoring Institute, which was designed to increase K-12 students’ exposure to medicine and the number of underrepresented professionals in healthcare careers. The club informs and educates students about careers in the medical sciences, including medicine, nursing, dentistry, public health, pharmacy, medical technology, psychology and scientific research. Students gain an in-depth understanding of the qualifications and processes required to successfully enter a career in the health sciences. gain hands-on experience in some of the basic techniques of health exams. pairing with a UVA undergraduate and a medical or nursing student who help guide participants through the college and graduate school admissions process. The Charlottesville Community Health Fair is held annually in conjunction with the Annual African American Cultural Arts Festival. More than 100 volunteers from over 25 community agencies and organizations provide health screening. The volunteers include premed students, medical and nursing students, nurses, nurse practitioners, residents, attending physicians, technicians, EMTs, administrators, and community workers. Each year more than 500 participants are screened. Besides an array of screenings and exams– including for BP, blood sugar, BMI, mammography, sports physicals, pulmonary function, peripheral artery disease, vision, hearing– the fairs provide an opportunity for health education and interactions with community services agencies. The fair is beneficial to the community and has revealed serious health conditions in some participants. Mini-Med School brings an abridged version of medical school to participating community members. Offered by the School of Medicine, the program lets the community experience the process a person goes through in becoming a physician. The program is open to high school students, UVA faculty and staff members, community members, and anyone who would like to learn more about the medical profession. During the seven-week program UVA faculty members, assisted by current medical students, lead the group in exploring of a wide range of topics in medical education. Participants experience such integral parts of medical school as active learning presentations, patient interviews, research labs and Match Day. The experiences promote health literacy and broader understanding of the health care system, increases awareness of the UVA Health System’s mission in our community, encourages future collaboration with community organizations, and understand the impact of biomedical science and research and clinical trials. For more information contact minimed@virginia.edu. ding: stem-cell research, telemedicine, bioethics, nanotechnology, bioterriosm, and global health. Additionally they learn the role physicians play in promoting good health, the fact and fiction about addiction, sexually transmitted diseases, including HIV and AIDS, the current status and future prospects for cancer, as well as the challenges and rewards of a career in medicine, dentistry, or biomedical research. For more information: UVA’s SMDEP website. The University of Virginia School of Medicine offers summer research internship opportunities to qualified college undergraduates considering a career in biomedical research. 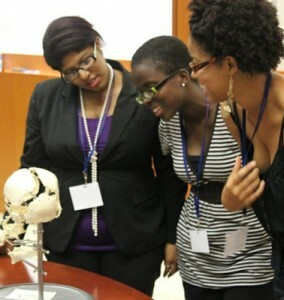 The program targets, but is not limited to, racially and ethnically diverse students in their junior and senior years. The program’s goals are to expose undergraduates to laboratory research and to familiarize them with the opportunities that exist for careers in biomedical research. Presentations and panel talks from our graduate students, along with free GRE tutorials, help SRIP interns successfully navigate the graduate school application process.